Step 1: Shut down all Windows programs. Step 2: Stop IIS server. To stop the server in the IIS Manager, right click the top node (not the website node) in the left tree and select Stop from the popup menu. This will stop the entire IIS server, as shown in the following figure. 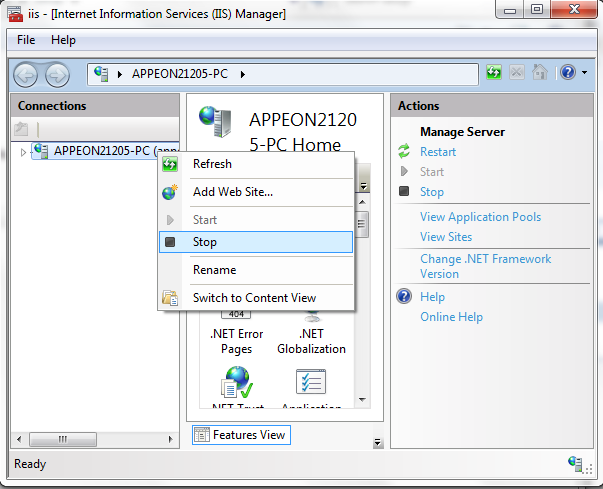 Step 3: Select Windows Start | Control Panel; under Programs, click Uninstall a program; select Appeon PowerServer 2019 for .NET and click Uninstall to begin the uninstall process. Before uninstall process starts, if the setup program detects that the IIS server is running, a warning message will pop up reminding you to terminate it, as shown in the following figure. Step 4: Click Next and then OK to confirm the removal of PowerServer. Step 5: Click Finish to exit when uninstall is complete.